Our recent trip to Scotland and subsequent workload have alas, inhibited new blog posts, as so much seems to be happening at once. Jenny and I experienced a glorious period of sunny weather in the Highlands, making for some really marvellous sketching experiences on the Fife coast and in the Cairngorm mountains. Fife has some lovely harbours that make for great painting compositions, and is a place I’ve missed out in the past because of my headlong rush always to get into the Highlands. It also gave us great pleasure to meet so many of our Scottish friends, a great many of whom turned up for my demonstration at the Pitlochry Festival Theatre. This post’s illustration continues the Scottish theme, showing a part of a watercolour of a loch where a promontory is coming in from the left side. So often we see these features as a dark mass set against lighter water. Before you begin work on this consider how you might tackle it in terms of values. In this example I have painted in the promontory so that the top edge stands dark and hard against the light water of the loch, while the bottom edge is light and soft, and in fact lost altogether in places. The one fly-in-the-ointment of our Scottish trip was the vast swathes of wind turbines now springing up all over the place, even encroaching on the stunning scenery of the Highlands themselves. If this continues it will totally destroy the reputation of Scotland for it’s outstanding and world-renowned scenery, and what to me is a truly tragic and criminal act simply aimed at vast profits for the energy corporations, and absolutely nothing to do with preserving the environment. I was so badly affected that for the first two nights there I could not sleep. 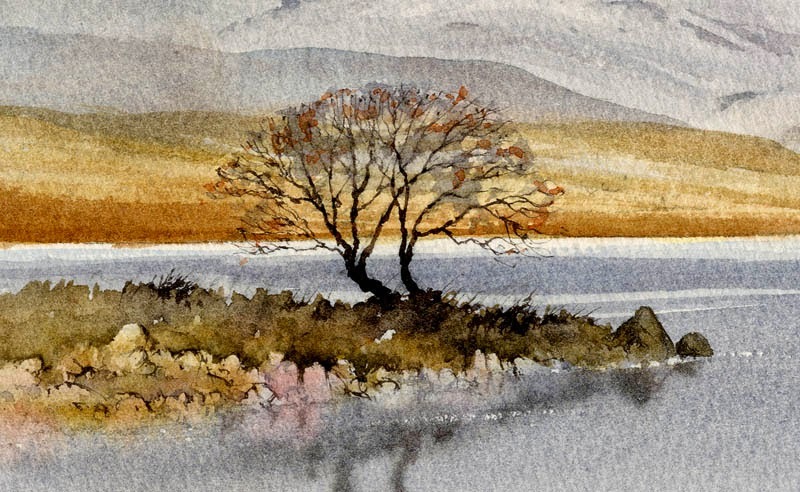 This entry was posted in David Bellamy, lost and found effects, wind energy devastating countryside, Winter trees in watercolor by David Bellamy. Bookmark the permalink. Nice example, would love to see the full view of this painting. Keep watching, Alan, I’ll include it at an appropriate moment. As the size I have to work with is rather small these small bits of detail tend to get lost if I show the whole painting, but for certain aspects the whole picture is of course needed. Rhoda, thanks for your comment. You are not the only one who has asked me to write to the Scottish Government. I’ll try to find time in the next few days to write something. I see wind turbines as an alternative to Mideast oil cartels. Yes, they interfere with the pristine view, but considering our global economy, I would rather survive with nature’s bounty that is free and clean, than with oil and coal that is so limited and detrimental to the earth. We can paint them out! Love your and Jenny’s work. Thank you for your kind email about our work. I’m sorry to take so long to reply but we’ve been away running a painting course at a place where it’s difficult to get internet communication (something that appeals to me!). I entirely agree with you about stopping the Mideast oil cartels’ monopoly. Like you I am deeply concerned about the natural environment. No attempt is made whatever in the UK to reduce our use of energy, and this gets worse every year, and many attempts at resolving the problem simply make things worse, not better, simply so that governments can say they are doing something for the planet when it’s usually just to make them appear concerned and taking action. There are so many problems with wind energy, problems that are hidden, but now being revealed. I could write a book on the subject, it is so alarming. When we were in Scotland last month much of north Scotland was suddenly blacked out. The biggest suspect is the instability of the electric grid caused by sudden drops in wind, which with more wind turbines coming on stream is likely to cause many more blackouts. Please don’t take my word for this – there is so much information out there now on wind energy, that it is not difficult to find. I am not against alternative energy, but I am against covering ALL of the Welsh countryside in useless wind turbines. Which is what they intend. Yes, I can paint them out, but it’s not my paintings that concern me. The natural landscape and wildlife is more important to me than artwork. And the fact that people’s health, livelihoods and property are being threatened by this industry. I totally agree. Those wind turbines are a disgrace. Fortunately you can leave them out of your painting. Loved your exhibition,I thought Icefall was stunning. I do agree with your comments about the scourge of windturbines in the Highlands and ask if there is anything you can do to draw attention to this destruction it would be most welcome.